Hi I’m Jeff Palmer, founder of the Case Acceptance Academy. What I want to talk to you about today is what is known in sales as BUY NOW. A Buy Now is an incentive for a person to get a discount or to get something extra if they agree to make a decision to buy now or within a given time period. So, let me give you an example of a buy now. Buy now is: You will get 5% off if you pay for your treatment today in full. That’s a buy now. If you pay for your treatment next week, you don’t get that. If you want to pay for your treatment as you go, you don’t get that. Now, people try to use a buy now to get people to close and it can backfire on them. And here’s how it backfires: If a patient doesn’t really want the treatment, they don’t desire to get that treatment done, giving them a buy now to make a decision now, will actually make you look like and feel like a cheesy used car salesmen. The buy now is best used when a patient has already made the decision and expressed to you that they want to get the treatment done and they’re just on the edge of “should I commit now? Or should I wait?” When you use it in that regards, and you say to the patient “well if you make a commitment today to get done what you know you need and want to get done and you’re willing to pay for it in advance in full we’ll give you a 5% discount, or we’ll give you a 10% discount, whatever discount” that is the person will usually agree and commit and pay because now they have a reason to make a decision, but they’re only going to make that decision and feel good about it if they’ve already committed to knowing that they want to get the treatment done, they’re just trying to decide if it’s the right thing to do today. That is how you use a buy now to increase your case acceptance and not drive people away by giving them a buy now if they haven’t already committed to treatment. 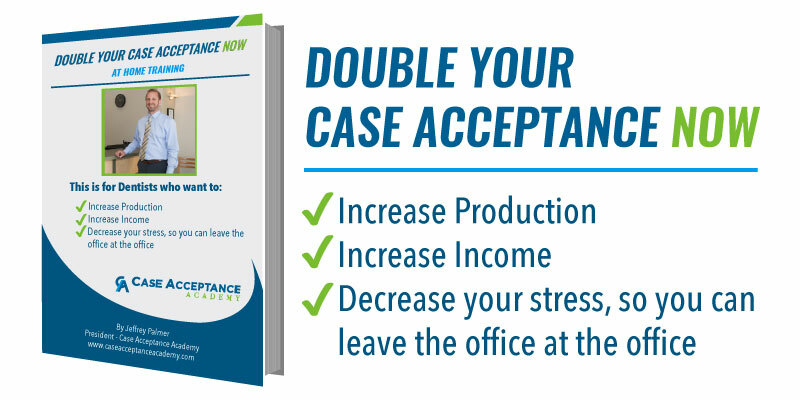 Do you want to Double Your Case Acceptance? This Free Report is designed for dentists who want to increase production, increase income, and decrease stress so you can leave the office at the office.